Orlov’s perfect attendance over the past four regular seasons has reached 328 consecutive games as of the conclusion of the 2018-19 campaign – a number that grows to 376 when you factor in the 48-straight postseason games that he has appeared in. A remarkable feat, no doubt. Especially when you consider what he went through to get here. Orlov was a highly-regarded prospect for the Capitals after his selection in the 2009 NHL Entry Draft, where he was the 55th player taken that year. The now 27-year old out of Novokuznetsk, Russia with a cannon of a shot had the looks of a future top-four defenseman. He made his first real impression in Washington with a very solid rookie campaign that saw him appear in 60 games, tallying three goals and 16 assists along the way. His future appeared very bright. His successful first season did not carry over into his second year, where he only saw five games with the big club and 31 more regular season games with AHL Hershey, due in part to a pesky shoulder injury. 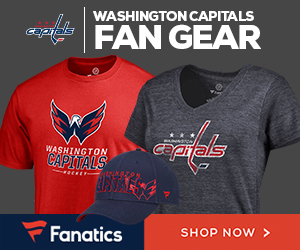 He then was left off of coach Adam Oates’ opening night roster to begin the 2013-14 season, bouncing between Hershey the Capitals’ press box on a seemingly nightly basis before reportedly demanding a trade out of Washington. It very quickly appeared that if Orlov was going to reach his potential, it wouldn’t be in Washington. Suspiciously, Orlov found himself as a regular on the Caps’ back-end for the remainder of that season following the trade request. Though Oates’ coaching drove Washington into the ground and the team missed the playoffs for the first time in over half a decade, Orlov established that he did belong, and it seemed like any burnt bridges had been repaired. Orlov, like many of his countrymen, made his way to the 2014 World Hockey Championship in Belarus. It would theoretically be valuable ice-time for a young defender in a high-level tournament despite the Caps missing out on the postseason. In the end, it was here where Orlov suffered a fractured wrist that required surgery and threatened to ruin his blossoming career. It was a devastating blow to a player in his impressionable early-twenties, a crucial time in a young player’s development both on and off the ice. The complexity and severity of the surgery caused his wrist injury to linger, which in turn resulted in Orlov missing the entirety of the 2014-15 season, save for a short conditioning stint in Hershey. It was very fair to questions whether Orlov would ever return to, or reach, anywhere near what he was capable of. “Dima’s” play may be up and down at times, but it is worth taking the time to recognize what he has gone through to become a high-level player that his coaches and teammates can trust to be in the lineup every single night. That isn’t something that you can say about many players in the NHL, and given the position he found himself in four years ago at this time, it makes it all the more impressive.